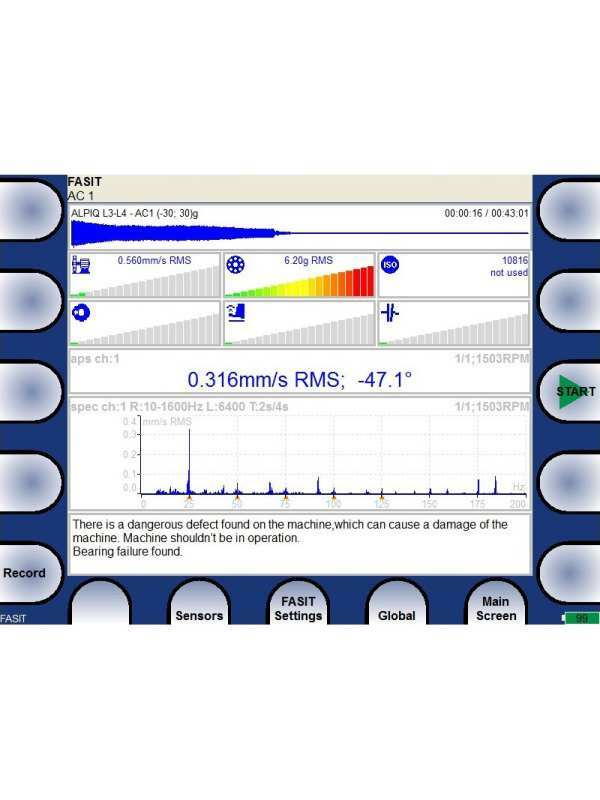 It is a valuable tool for maintenance engineer for fault diagnosis, balancing and data collection / recording. Lubrication Control - NEW !! 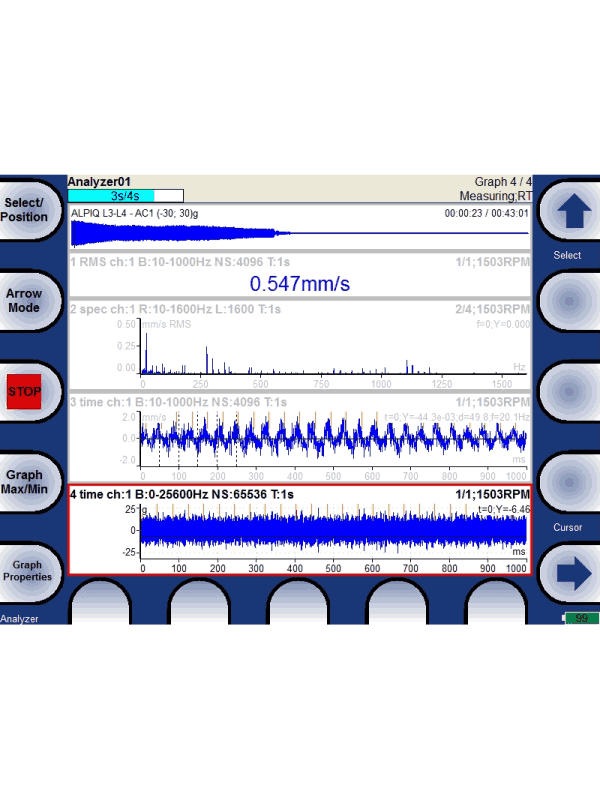 Measurement of 4 channels simultaneously gives a lot of flexibility in fault diagnosis. For instance, you can get a good insight of the alignment by measuring the radial and axial vibration across the coupling of the motor and pump. 64 Gb allows 20 hours continuous recording of 4 channel raw signals up to 25.6kHz. Even under pressure, you don't have to worry that important data could be missed. bearing fault, unbalance, misalignment, looseness and others. FASIT is a handy tool even for experienced vibration analyst. Example shown on the left indicates fault in the bearing; and also unbalance which usually happens in later stage of bearing fault. Multi-measurements can be measured in parallel for a single measurement point, which save time and improve consistency in data especially when the machine speed or running condition varies with time. Vibraton Monitor VA4Pro provides professional 2-plane balancing function. The whole balancing process will be guided on screen with easy-to-understand figures and instructions. The weights will be automatically splitted and calculated for situations where the location of weights is limited, e.g. fan. 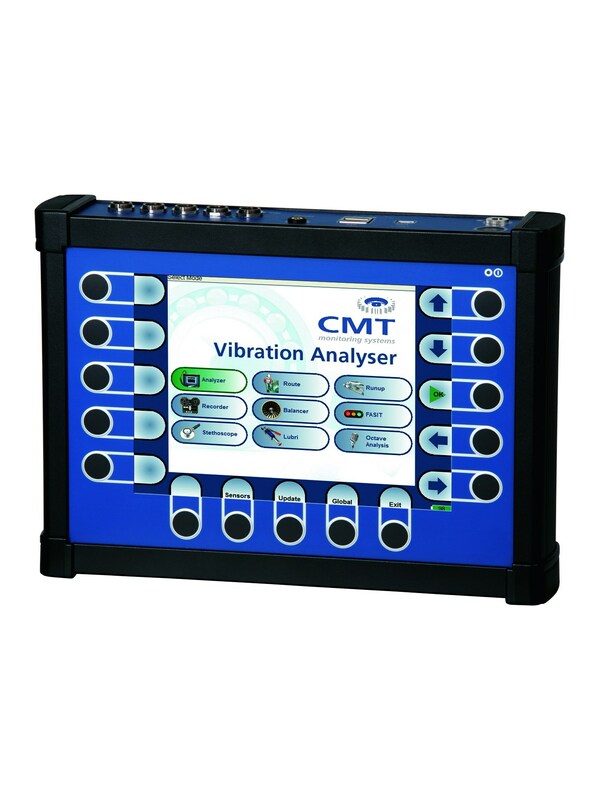 Vibration Analyser VA4Pro can be used as a Data Collector for routine data collection. Parallel Measurements are peformed simultaneously, that save time in data collection at each measurement point. It also improve consistency of data especially when the speed or process condition of the machine varies with time. For experienced user, historical data can be downloaded for on-site trending and comparison, so that diagnosis can made on spot immediately. Run-up / Coast-down or Vibration Time History (overall & spectrum vs time) can be easily carried out on Vibration Analyser VA4Pro. Raw time data can also be recorded as a backup for critical machine. 4 DC Process Parameters can be measured at the same time for correlation analysis with vibration readings. The Vibration Analyser VA4Pro can provides Octave Analysis (1/1, 1/3, 1/12 and 1/24 Oct) for sound and vibration measurement. Human perception to noise is close to octave frequency bands. Using the high resolution 1/24 octave analysis, more accurate measurement can be made to determine the frequency of interest. Octave analysis can also be used for machine monitoring. Its high resolution at low frequency can be used to identify the harmonics of rotating speed; and the increase in vibration due to bearing or gearbox fault can be seen at the high frequency as well. We offer a special Vibration Monitoring brochure. If you are interested in further Information about this product please download the data sheet for free or visit our online product catalogue.